WASHINGTON (AP) — Steve Bannon, the blunt-spoken and divisive strategist who went from Donald Trump’s victorious campaign to a top White House post, has been pushed out by the president, capping a turbulent seven months that witnessed the departure of much of Trump’s original senior staff. A favorite on the farther-right flank of the Republican Party, Bannon had pressed Trump to follow through on contentious campaign promises, such as banning travel from some predominantly Muslim countries and pulling out of the Paris climate agreement. Bannon left the White House on Friday and immediately returned as executive chairman to Breitbart News, which he led before joining Trump’s campaign. The news site said Bannon presided at its Friday evening editorial meeting. Trump has not spoken publicly about his latest personnel decision, but he tweeted praise for Bannon’s return to the conservative news outlet. “Steve Bannon will be a tough and smart new voice at @BreitbartNews ... maybe even better than ever before. Fake News needs the competition!” Trump said Saturday in one of two tweets. He also thanked Bannon for serving. “He came to the campaign during my run against Crooked Hillary Clinton - it was great! Thanks S,” the president said. Trump now has forced out a national security adviser, a chief of staff, a press secretary (whose last day will be Aug. 31) and two communications directors — in addition to firing the FBI director he inherited from President Barack Obama. Bannon’s departure is especially significant since he was viewed as Trump’s connection to his base of most-committed voters and the protector of the populist conservative agenda that propelled the celebrity businessman to the White House. From Breitbart, there was a dramatic one-word warning. ”#WAR,” tweeted Joel B. Pollak, a senior editor at large at the news site. Bannon’s nationalistic, outsider conservatism served as a guiding force for Trump’s rise to office. He injected a dark populism into the campaign and sharpened its attacks on Democrat Clinton, encouraging Trump’s instinct to fight and counter-punch at every turn. When the release of a 2005 tape, in which Trump is heard boasting about groping women, threatened to capsize the campaign, Bannon attempted to turn the tables. He gathered a group of women who had accused Bill Clinton of sexual assault and tried to ambush Hillary Clinton at a general election debate. But Bannon was also accused by his critics of leaking to reporters in a bid for self-promotion, and of egging on Trump’s most damaging impulses. A combative and unorthodox Republican, Bannon was a contentious presence in a White House divided by warring staff loyalties. He repeatedly clashed with other top advisers, most notably Trump’s son-in-law, Jared Kushner. His puppet-master image drew the ire of the president, who at times bristled at the perception that Bannon was the mastermind of his campaign victory and the force behind White House policies. One person close to Bannon said he had offered his resignation to Trump on Aug. 7. It was to take effect a week later, the one-year anniversary of when he officially joined Trump’s campaign. But the departure was delayed after the violence in Charlottesville, Virginia, said the person, who spoke only on condition of anonymity to discuss private conversations. In fact, Bannon had been on shaky ground for weeks, and his job appeared in jeopardy when Kelly announced a personnel review of West Wing staff. Though Bannon had recently adopted a lower profile, he again became a flashpoint following criticism from the right of national security adviser H.R. McMaster, which some blamed on Bannon. Trump’s refusal to single out white nationalists for the violence in Charlottesville also raised questions about the advice he was getting from his combative aide. The president, meanwhile, downplayed Bannon’s campaign role and passed up an opportunity to express confidence in him. 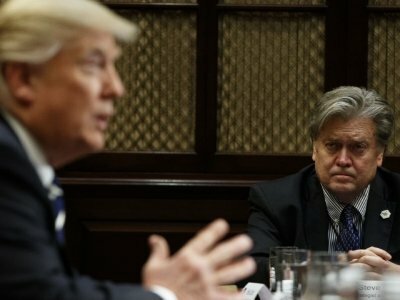 Trump had recently signaled to confidants that he was going to dismiss Bannon but had not settled on a timeframe, according to another person who had discussed the matter with the president but was not authorized to speak publicly about private discussions and insisted on anonymity. Still, Bannon had been telling people as recently as this week that he believed his job was safe and he would leave only if fired. “If there’s any confusion out there, let me clear it up: I’m leaving the White House and going to war for Trump against his opponents — on Capitol Hill, in the media, and in corporate America,” Bannon told the outlet. Lemire reported from New York. Associated Press writers Julie Bykowicz and Bradley Klapper contributed to this report.